I would not be the first to start a review of a degree show – in this case an MA show – with a few cautionary comments. There are lots of people in degree shows – eighteen in this – and doing them all justice would probably require a small book, but since this is a magazine review, much of what follows is necessarily brief and more descriptive than analytical. Moreover, since this is the work of young artists, or at least newly emerging ones, seeking success in a very difficult and crowded area, one would instinctively wish to focus on the positive. On the other hand, a Masters Degree implies a high level of achievement and this suggests that one should approach the work with rigour and high expectations; that one should seek mastery of the medium and masterful understanding of the conceptual implications of the work. The show is in two parts: a foyer/gallery space proper and a series of studio spaces adapted for the purpose. Taking the latter first: passing down a narrow corridor, you see a small rack containing compliments slips; in an Acconci-esque provocation, Michel Ayoub announces that he has only done this in order to ‘have more women’. In the same corridor plays a whispered soundtrack making references to connection and disconnection. Similar words are set out in strips of Dymo-tape on the walls beneath photocopied images of plain torn paper and of faces distorted by folding and overlaying. This is the work of Maria Luisa Vélez – more on her shortly. Further along the corridor, Michel Ayoub occurs again, first raging against a pop record played to death in his home land, and then in a video of a mock terrorist pronouncement in which worms claim responsibility for various recent natural disasters and quibble about the suitability of women for giving birth. In a side room are large paintings on paper. The works of Mihyun Anne Kim, they are wistful contemplations of nature – bushes and trees – seen through cool institutional window bars, and hard not to interpret as an expression of the anxiety-expressed-as-ennui of a displaced young person endeavouring to come to terms with an alien culture. Perhaps affirming this view, the body of work is entitled ‘Hope’. In the adjacent space is the work of Menglu Pan, a cluster of small frames, each containing a sketch of a single eye, each drawn in a different style. The work is called ‘Conversation’, suggesting that the eyes are engaged in some form of silent communication. Next is another cluster of small frames hung on strings, Messager-style, containing snapshots of architectural details from a Far-Eastern town. 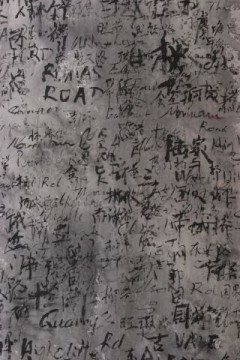 The title of the work, which is by Lea Peng Lian, proclaims, perhaps hopefully, that ‘This is not about pretty pictures’. Opposite and by the same artist is a series of pages from books cut to form a regular pattern. They are delicate and enigmatic. They could be, at once, Chinese lanterns, models for multi-storey cark parks, part-formed paper decorations, ready to be cut into strips and hung, or commentary on the book they have defaced. 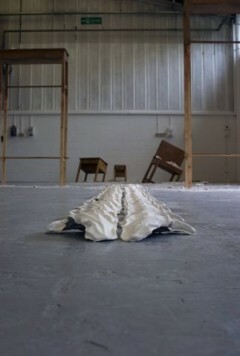 In another room is a two-part video by Lisa Brown called ‘Articulation of Emotion’. One screen shows children playing innocently; the other shows a rag doll being violently abused by an unseen assailant. Further work by the same artist in another room explores similar themes: dotted around are objects that contain the means both to soothe and inflict pain. Adjacent is Eve Dawson’s ‘Spatiotemporal’, a room-sized installation of wire, wood and wallpaper, which references Stockholder and possibly Cady Noland and Jason Rhoades. Through thoughtful relationships between colours, textures and shapes, the work breaks up, re-articulates and redefines the space. Ivy Chi’s series of painterly self-portraits has overtones of the work of English painter Chantal Joffe, the images capturing a succession of selves, invented and represented through colours, moods and artefacts. Nearby, Ju Tianyang also brings two cultures together: ‘Roads’ articulates a journey. Chinese-style script quotes English street names. This is set on scrolls – the traditional Oriental means of describing a journey – but the scrolls are on canvas – the longstanding Western painting surface of choice. 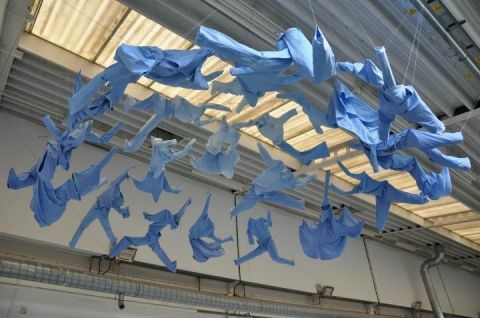 In a large space – the college’s sculpture studio – you encounter first an airborne array of clothes, assembled as though being worn: skirts follow blouses, jeans follow shirts. All are dyed in the same sky blue. The work of Chun Yu (Daniel) Yang, it has overtones of the carousel death ritual in Logan’s Run or the comedic cruelties of a Beckett play; it is as though the sky has become one with a giant spin dryer in which empty shells of people fly around pointlessly in circles. On the floor and walls are the vestiges of a faux ritual. Charlotte Brett’s piece, ‘Death Line’ uses canvas, burnt gunpowder, enigmatic symbols and a strangely comic half-formed bird to give the sense of a ceremony, which seems to have been intended to bring back to life some kind of phoenix variant, but has failed or been stopped half-way. Nina Pancheva-Kirkova’s series of paintings called ‘Utopia’ are an ironic comment on this failed modernist project. They depict post-apocalyptic landscapes with, here and there, hints of what might have been. 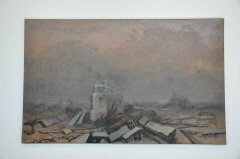 A shape that might be Tatlin’s Tower or the vestiges of a helter-skelter after a bomb attack appears in the smoky foreground of one and typifies the mood of the set. You approach Sarah Misselbrook’s piece ‘Conformation’ via a line of what might be cherub wings, which lead into a nightmare classroom of distended and smashed desks. As the title indicates, this work, like one of those dreams in which you get your own back, rails against the oppressiveness of a catholic education. Nearby, the same artist has a video, viewed furtively through key-holes, in which a character tortuously assembles communion wafers into the letters of a cry for help. The culture-clash theme referred to in some of the above recurs in the work of Md Ridhwan Hj Md Ruslan. A stark chip-board corridor simulates the alienation induced by its equivalent in his UK student home. Meanwhile, ‘Westminster Bridge’, a series of looped videos shot on a rainy London day, takes the fleeting reflections of passing strangers on wet flagstones and flips them upright, converting them into shimmering chimeras. A video by Maria Luisa Vélez extends her ‘Disconnected’ theme. This time, faces are projected into receding flaps of paper, creating a more satisfactory exposition of the themes of fragmentation and disconnection mooted in her corridor pieces. Similarly, Eunah Byeon, represented elsewhere by abstract paintings of the same name, has an installation called ‘The images of my mind’. Whether or not the works meet the ambitions of the title is subjective. However, the installation – watery images projected onto a deep wall of vertical, dangling red ribbons which then roll around uncontrolled on the floor like the disembowelled contents of a giant tape cassette – has a soothing, flickering red-orange glow and, perhaps, a womb-like quality. Additional works by artists in the studios are also to be found across the road in the airy gallery/foyer space, but you also see works by others. ‘Manifesto I’ and ‘Manifesto II’ by Maryam Alaku seem informed by a sense of futility. ‘Manifesto I’ is a grid of photos of a black person’s mouth, each with a series of unreadable words written over it. ‘Manifesto II’ is a video in which words rush past too fast and distorted to be seen and are spoken too fast and distorted to be heard. Modern art history is of course littered with doomed manifestos, but ‘manifest’, without the ‘o’, is also the word for a ship’s inventory. 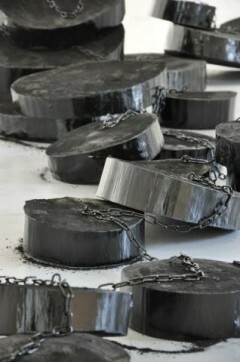 Given the artist’s African origin, the slave trade comes to mind; a thought supported by the near presence of a further piece by the same artist, made up of threatening black chains and weights. Jun Qin’s drawings combine overtones of modernist rationality with intuitive creativity. Graph-paper technical drawings – themselves long made obsolete by CAD drafting programmes – seem to be the outcomes of Lewitt-esque concepts, but these are overruled by a set of unprogrammed decisions, creating a kind of rigid, contradictory expressionism. Maryam Koleini’s ‘When Samothrace Told Me the Story of My Birth’ is a substantial number of small drawings which explores, mixes and remixes a set of leitmotifs. Comprising Leonardo anatomical studies and various references to classical antiquity it gives the sense of someone obsessively and anxiously exploring how broad and ancient cultural mythologies might be assimilated into a contemporary personal one.